Our two previous VentureBeat articles cover the composition of a data science team and the skills we look for in a data scientist. To recap, great data science teams rely on four skillsets: Data Engineer, Machine Learning Engineer, Optimization Engineer, and Data Journalist. If you want to maximize the number of qualified applicants, try posting roles with those four titles and skill sets instead of seeking out generic “Data Scientists”. Retaining talent requires attention on several fronts. First, the team needs to be connected to the value they’re driving: How is their project impacting the line of business and the enterprise? Second, they need to feel empowered and know you have their backs. Finally, when planning for your team, build in 20–25% of free time work on innovative, blue-sky projects, to jump into Kaggle-like competitions, and to learn new tools and skills. Carving out that much time might seem pricey in terms of productivity, but it provides an avenue for the team to build the skills that accelerate future use cases — and it’s far more efficient than hiring and training new talent. Map out the decisions being made and align them to tangible value, specifically, cost avoidance, cost savings, or net new revenue. This is the most important step in this process and the first step in shifting data science from research to an integral part of your business. We’ve previously mapped out a process for doing this in Six Steps Ups, but briefly, it requires direct conversations with business owners (VPs or their delegates) about the decisions they’re making. Ask about the data they use to make those decisions, its integrity, whether there’s adequate data governance, and how likely the business is to use any of the models already developed. Value each decision. Making decisions more quickly and with greater efficacy avoids costs, saves costs, or creates additional revenue. Express this value using whatever methodologies and terms your CFO advocates. Prioritize the decision portfolio. This exercise creates a decision portfolio, which can serve as the basis for a data science backlog. 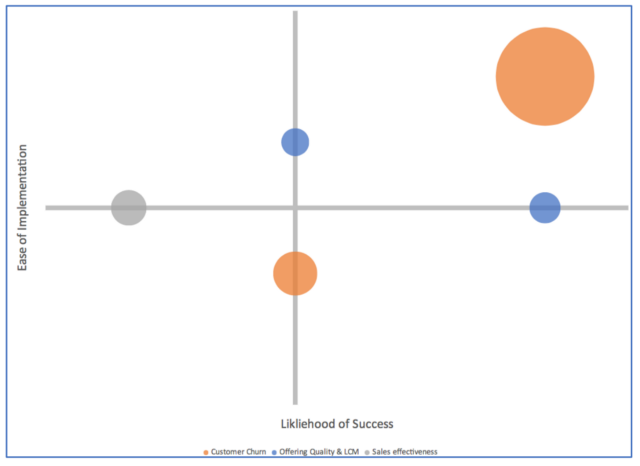 Prioritize the backlog by assessing the likelihood of success, the ease of implementation, and the value (based on the scoring metric in the table above). We’ve developed a framework for building and prioritizing the portfolio by going through this exercise ourselves. Discrete Deliverables. Next, take your top decisions and break them into manageable chunks that you can deliver in small sprints. This starts by identifying the minimal viable product (MVP) and then working back from there. Consider three-week sprints that can start delivering value (however small) after two sprints. Moving data from a research project to an integral part of your company requires operationalizing your data science program. In addition to building the team and setting the strategy, it requires integrating the models into processes, applications, and dashboards. Also plan for continual monitoring and retraining of model deployments. Truly integrating the models means they can’t be deployed as csv files sent by email or code tossed over the wall to a development team. They need to be deployable as reusable and trusted services: versioned RESTful APIs output directly from the data science platform. Delivering models as csv files severs the connection to the process — and the feedback that comes from the implementation. Tossing R or Python code to a development team to convert it into an API is inefficient at best. But be prepared for some work. Setting up a robust process can often take three to six months and needs to be configured as a feedback-loop that easily allows your team to retrain and redeploy the models. Applying predictive or prescriptive analytics to your business inevitably requires you to retrain the models to stay current with the accelerated rate of change they are driving and based on the feedback to the models from the outcomes themselves. We’ve seen instances where a team develops more than one hundred models to drive a single decision over the course of a year only to develop zero models the following year because the team is now focused entirely on monitoring and retraining of their existing models. It’s important to recognize that this isn’t a defect in their approach. They needed to build that many models to solve the problem. The issue is that in the course of operationalizing the model deployments, they didn’t automate the monitoring and retraining of those models. Unless you’ve already executed a large number of data science projects for the enterprise, the challenges of operationalizing can come as a surprise — but they are very real. Derived data products. We can often overlook the fact that our engineered features are valuable data in and of themselves. As part of model building and engineering, consider deploying this new data as APIs and integrating them into the appropriate data assets rather than letting them remain proprietary. For example, if a data science team engineers a feature that combines customer data, product data, and finance data, deploy the new feature as an API and have the corresponding model consume that new API. Individual contributors might resist the shift for a few different reasons. They might be worried they’ll be replaced by the machine or that the people who built it don’t fully understand the process or environment. Both are valid concerns. Buy credibility by being honest and addressing concerns head-on. However, in most cases you won’t actually be automating anyone out of a job, but rather making each job safer or more efficient. Help the team to see this directly. For the concern that the data science team doesn’t really understand what they do, consider pull one of the hold-outs off the floor and asking them work directly on the project as a product owner or subject matter expert. That provides other resisters an advocate that is “one of us”. When that team member returns to his regular job, you’ll have an advocate for the current data science approach, as well as an advocate for future implementations and deployments. Finally, you can overcome the culture shock by raw mass. Identify a use case and build a related hack-a-thon that’s sponsored by senior executives. The hack-a-thon should include basic presentations on machine learning, cloud, and APIs, as well as more advanced presentations and conversations on the same topics. Let the teams work hands-on with the use case and allow individuals across the company to participate, independent of their training and background. To turn the alchemy of data science into gold, enterprises must align their data science efforts to business outcomes with real and tangible value. They must stop focusing on experimentation and shift their efforts to data science as an integral part of their business models and align these with corporate priorities. If you follow the methodology above, the music will keep on playing, the funding will keep flowing, and data science will not be a scam in your enterprise. Good observations and suggestions - the potential "Data Science" scam is easy for companies to fall into and risks future investment. 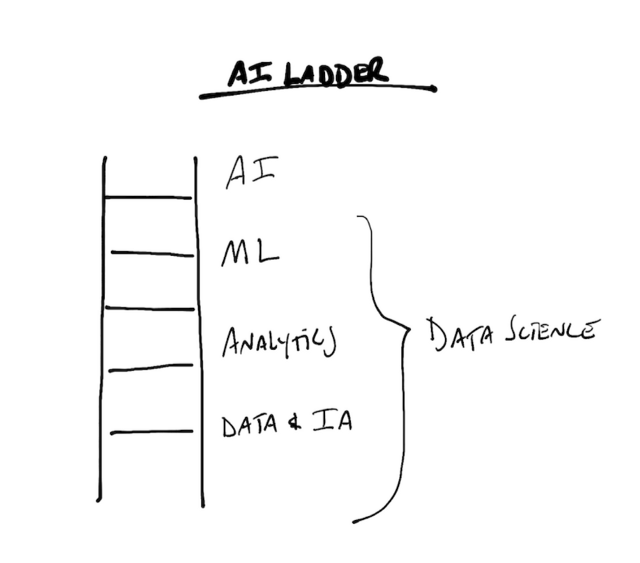 Perhaps similar to Steve's Derived Data Products, I would consider splitting out good ol' "BI" below its current "Analytics" on your ladder (but above "Data & IA" fundamentals) - not to split hairs but to differentiate, because BI apps (PowerBI, Tableau, Qlik, TIBCO etc) can be quick to employ for immediate cross-analysis of categories, boundaries and targets to get the business to focus on where the more predictive or algorithmic Analytics should add value. BI can also be used to help quantify the benefits post project. Why wait 1.5 months for first sprint value from deeper analytics when you could get BI head-up and decision value providing guidance within half that? It seems in the phrase BI being gradually replaced by Analytics, many orgs just don't have adequate BI level of sight to act as the foundation for Data Science, including its provision of good measures of success. John - you are right: there will be unfortunate casualties: very promising junior data scientists who won't get a job anymore. It has already started to happen: I see more and more junior data scientists from all over the world, who want to connect with me on LinkedIn. Many have this statement in their job title: "actively looking for work / internship." I am not sure how best to change this situation. Anyone with a degree (be it engineering, math, data science, operations research, MBA) from a respected school (MIT, Stanford, Berkeley, NYU, Carnegie Mellon etc.) I accept the invite. Yet it makes me a bit sad: I was not born in wealth, I come from a small unknown university (Namur, Belgium) but somewhat managed to succeed despite my modest background. I have ideas about how to change things (see first doctorship in data science) but at his point, I am interested in partnering with professionals who want to make a positive impact on our profession: I don't have the time or resources to do it myself alone, being extremely busy working on a number of projects. I do have a concern about lower level people losing their jobs and possibly having to change careers because of the sins of their bosses, but that happens in every bubble and is probably unavoidable (I'm sure you're old enough to know the term "dot bomb"). But I agree that "data scientists" who have proven their value will have no problem keeping their jobs or getting new ones (karma usually works well in the job market); if nothing else, the occasional recession is a guarantee of full employment for competent econometricians. The problem I have with the term "data scientist" is that it is overly vague. If you think about it, all scientists are data scientists because all real science is driven by data (such is the nature of the scientific method); and forget about "theory free" data science; there is no such thing. But I'm a mere "data engineer" (aka a statistical programmer), so what do I know? In a different context, I am now purchasing a new big home in Anacortes. People who lend money have now figured out who they can trust: a guy (me) not on a payroll for over 6 years, yet after due diligence the lender knows we can pay everything. People with a big W2 income may be rejected for that kind of loan. The same will happen with data science: very soon, hiring managers will be able to easily figure out who can truly deliver ROI, and those who are not known for delivering ROI, won't get a job anymore. It is somewhat of a concern, but not as big of one as it would have been if "data science" were actually new. The bubble will assuredly burst, but those researchers who have been straightforward with their superiors and clients about what they can do for the organization will probably come out of it all right, though they might have to go back to calling themselves "statisticians" or "data miners". And those who have been overselling their capabilities deserve what they get. In particular, the decomposition of the mystical data scientist into component roles. For those who struggle with staffing advanced analytics, this helps immensely - the variety of personality in these roles will allow recruiters and leaders to manage beyond 'alchemy'. It's also good news in wolf's clothing. Hiring the few scientists now means hiring more, defining their methods and relating their roles to mission, objectives. Growing pains are signs of growth, maturing. Again, good note. Well said. I also wrote another LinkedIn article on Oct 29, 2017 where I laid out my concerns for the hype surrounding “big data analytics.” The concern being that the business case value of data analytics was not being established and that was leading many people to allocate analytic resources to irrelevant problems, which was ultimately leading to their eventual failure. The real point is that data analytics needs decision management to increase the likelihood of it being effective to the organization that uses it. I think on this point we concur. Bill, The goal of this post was to lay out what it takes to build a data science team and more importantly what you should and shouldn't do when building an entire practice from the ground up in a fortune 500 company. It was not to go into any mathematical details about the topics you describe. I made a similar argument just a few months ago. 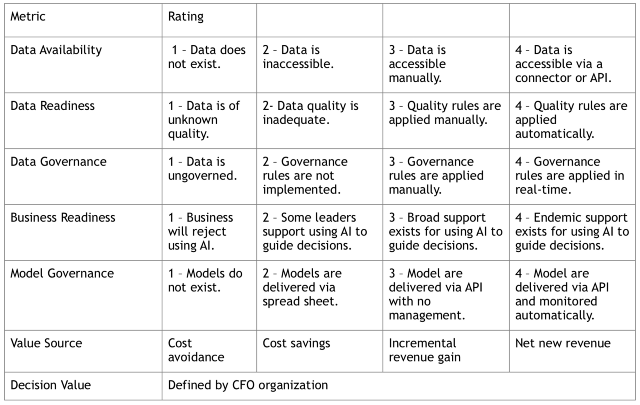 Data science efforts need decision science oversight.